What a frustrating week and weekend. My broadband connection was down and still is until today so I can’t check my emails and do posting for the last few days. I am doing this now from the office….sigh! and I have to do it fast as its late. Didn't manage to do a lot of inter netting for last few days due to work commitment. I will be on traveling to KL in the next few days to attend a very "stressfull" meeting. My hair is already falling thinking about it. Maybe can tell u all about it later...or maybe not...depending on the outcome. 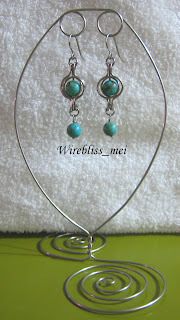 Well, weekend was busy as usual but I managed to do my first earring stand. Not that great but seems ok so far. I made this with a 19g wire. After that I decided to make a very bold color earring….bold for my taste, at least. 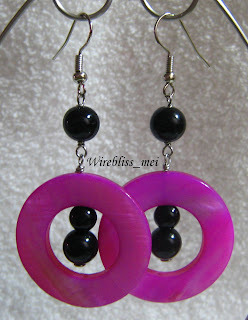 Its made of dyed shell and black agate. Labels: Earrings , z Stones and Tools Share it! I think your earring stand is a super design. You have inspired me to have a go. I would really like to make one that holds lots of earrings - all my earrings are bundled in a drawer of my jewellery box and I nearly always have to tip them out to find matching ones! I love wearing earrings and think it would be nice to display them. I especially like the way you have used the spirals as 'feet'.